EUIV: Alternate History. Being an Ottoman Emperor and Conquering The Word from my Study. I’ll admit I’m a bit of a history and military fanatic. 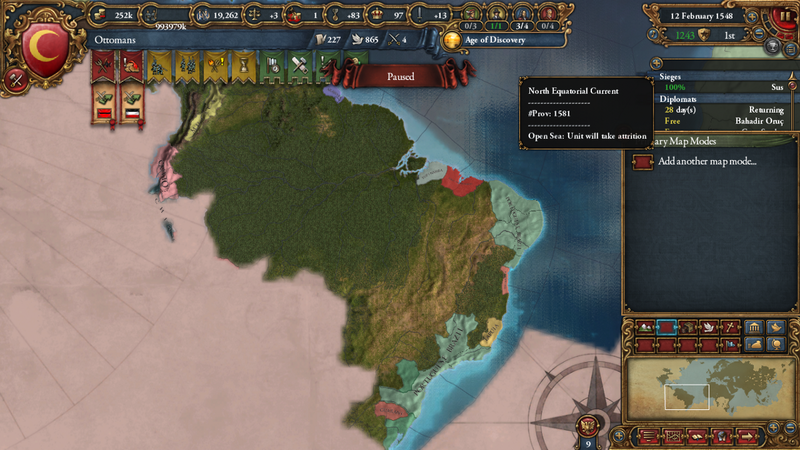 So Europa Universalis did sound like the game for me. 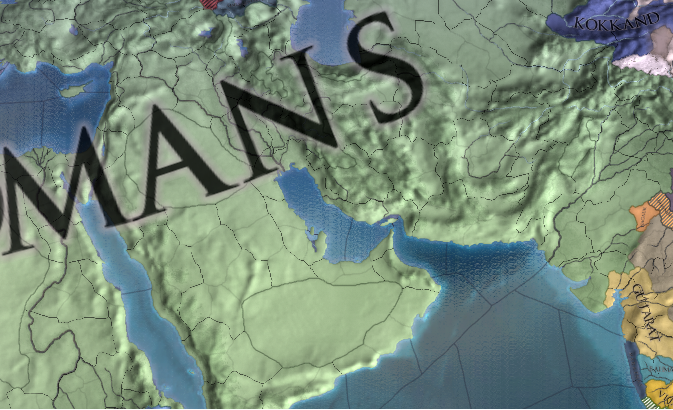 I took over as the Ottoman Empire in 1454. 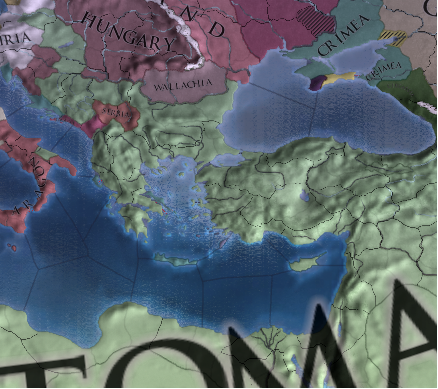 Just as in real life, the Turks were picking the carcass of the Eastern Roman Empire. 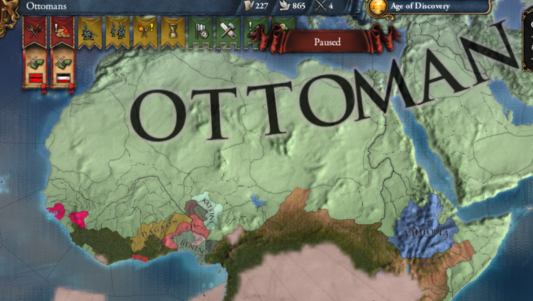 The Ottomans were well strategically placed for storming into Eastern Europe, the Middle East and North Africa, so it was a good place to start. With the Byzantines at this point having an Empire, consisting of just Constantinople and a few surrounding fields, I was able to capture the city well ahead of schedule and made headway into the Balkans. Albania was captured quickly, allowing me to storm through to Vienna, which fell with the Austrians involved in fighting elsewhere in Europe, leaving their capital unguarded. The next main campaign was to take on the two regional competitors: The Mamluks in The Holy Land and North Africa and the Timurids of Persia, challenging one at a time. I was able to defeat both through careful campaigning, which including fortifying my borderlands and hopping from province to province. This meant there was no other major player in the region, giving me a free run on Central Asia, Russia, North Africa and South Asia. I was able to play the Kazakhs and Uzbeks off against each other, leaving no force powerful enough to beat me. The parts of Siberia are tough to hold as they are not easily accessible, meaning in case of conflict, I need to leave a sizable portion of men there. 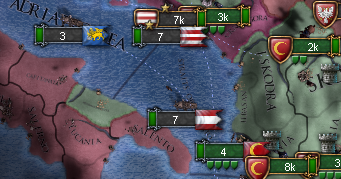 Planning for a wider conflict with European superpowers and a colonial campaign, I also captured Bari in Italy. This gave me land on both sides of the entrance to the Gulf of Venice, the world’s most lucrative trade route. It also gave me a platform from which to begin a potential raid throughout the Italian Peninsula but I decided not as there was bigger fish to fry. Capturing most the Northern half of African continent was time consuming but also fairly straightforward. A lot of land was still unclaimed and though there were lots of rebellions I was able to put them down with ease, this also gave me access to natural resources, plenty of ports, men and put me right in the doorstep of the Iberian Peninsula. I captured some colonies too, despite controlling stretches of land all the way to Bengal from Vienna, I wasn’t able to keep on to most of it. Nor was I able to keep onto parts of modern day Thailand. But I do have land in the Malay Archipelago, giving me access to valuable spices. The unrest and separatism here was the greatest, but ultimately, a superior army and navy prevailed. In Bengal, I simply allowed my provinces to be taken, before surrounding them, forcing them to leave and re-capturing. With the Reconquista having been completed during my adventures in the Far East, I had managed to recruit a lot of men from North Africa and various other parts of the Empire ready to undo it. I formed an alliance with the King of France and attacked from the South West going upwards, most of Portugal crumbled quite quickly. 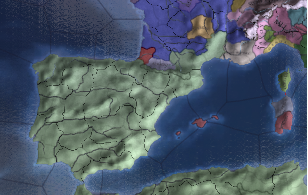 Spain was a bit of a mixed bag, Toledo took me three years to be-siege, the longest of every province of the game. Conversely, Barcelona crumbled very easily. After I was done, I took a few cities in France, by this point my armies were strong enough to take the King of France, so I stabbed him in the back. It was wrong of him to side with me in the first place anyway. 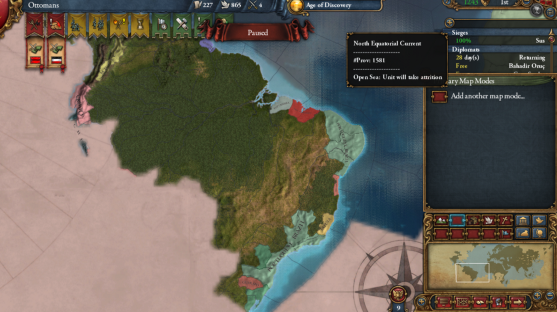 This also gave me control of Portugal’s South American provinces, which would later become part of Brazil in real life. I didn’t want them particularly, but I have them. 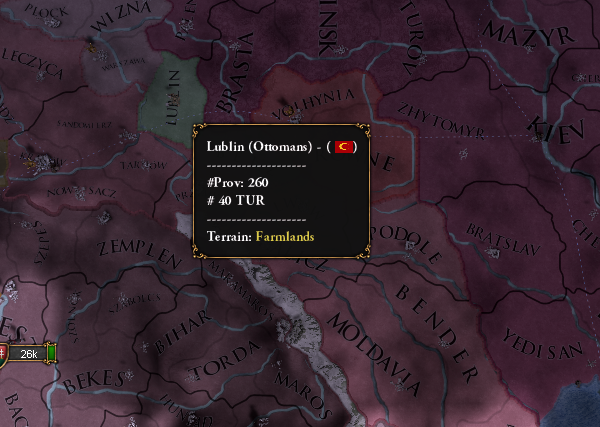 Also I have just noticed I control Lublin in Poland. I honestly have no idea when I captured it. But it is very useful to have farmlands. I need as much as possible, with a lot of my territory being mountainous or desert. Overall, I have done well in this game by being clever. Military might alone will not lead to a successful serious of wars. You need to be selective about who you attack when, who you ally with and the type of land you capture. Whenever I captured a province, I’d immediately core it and recruit regiments and build ships, this was time consuming but it allowed me to build up a huge army. Religion is a great uniting force. By sending missionaries to all my provinces, I was able to bring them under my control. By becoming Defender of The Faith, I portrayed myself as a pious leader for them to follow. The decisions you have to make are very interesting, for example your response to hearsay. Are you going to burn books challenging your claims? I also caused a minor rebellion, after my heir died, I choose not to mourn him and instead got quite close with a palace maid. I just wanted to see what would happen. Don’t do that. It’s a game, I’d recommend for people interested in medieval and military history and those who like games that are intellectually challenging. 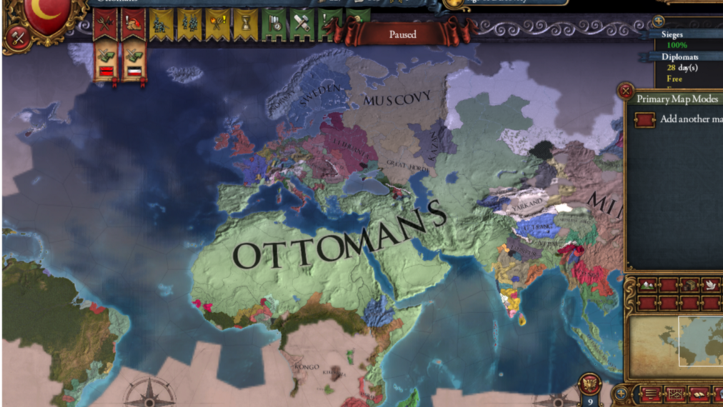 I certainly enjoyed this save with Ottoman Empire. As my friends point out, I probably shouldn’t mention the game if I want to flirt with girls or just generally socialise with people around the university or London, but it is what it is.